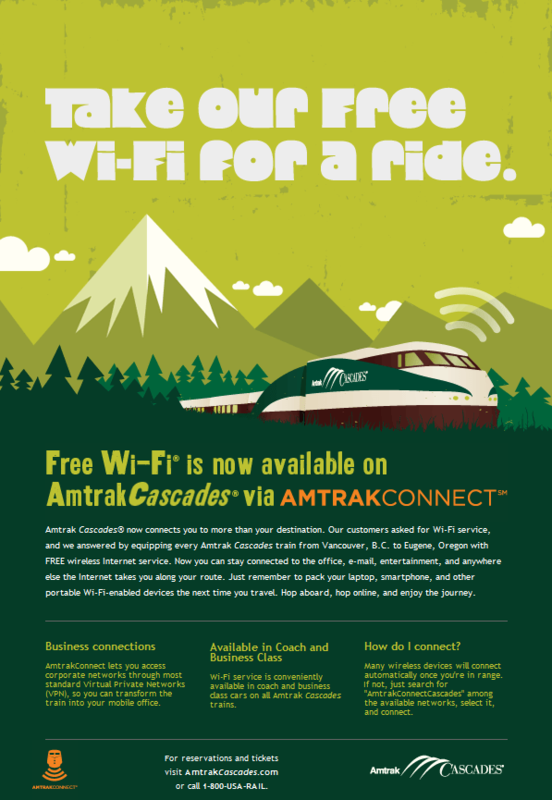 Free Wifi on the Amtrak Cascades! So far I’ve checked out a number of neighborhoods in Seattle. The winners of “awesome” so far are Ballard and Capital Hill. I’ll admit there are a few others that I haven’t been able to check out thoroughly yet. One of those is Alki Beach area. Another is some of the northern neighborhoods, even some of the southern or other western neighborhoods. My questions is, what other neighborhoods should I check out Seattleites? I know there have to be more hidden gems, but I don’t know exactly where to look and the “end of lease” time on the apartment is coming up. 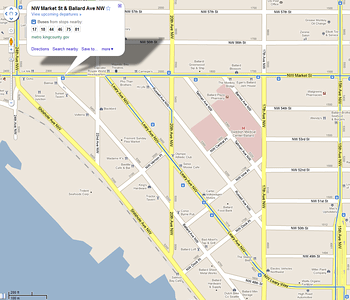 I do like the close proximity to downtown that Belltown provides, BUT, it’s not exactly what I’m looking for. I want my preferred mix of art, culture, music, ease of access (re: transit without nasty Interstates/major highways nearby making a racket). Any ideas out there? Madrona? Other? Scroll to the end of this entry for a key to the measurements I use in comparing neighborhoods. I’ve been out to Ballard a number of times. I also know a few people that live out that way. The neighborhood is suburban in nature, but it is of the town center layout model. The neighborhood leads outwards from a town center area close to the Salmon Bay. My general ride to explore the area from Belltown consists of jumping aboard the #18. This bus provides a quick & easy single seat ride from downtown Seattle, through Belltown, by Queen Anne Hill, and directly into downtown Ballard. It’s a quick and easy ride without much ballyhoo from miscreants or wierdos. Especially during rush hour when they’re are extra express buses run along this route and the working class are always cordial and somewhat jovial, with smiles abounding as ladies are first onto the bus and drivers greet the riders. Google Images with the search Ballard, Seattle, WA. Bing Images with the search Ballard, Seattle, WA. Architectural Mix: Cape Cod, Coastal, Colonial, Contemporary, Modernistic, European, Feng Shui, California, Row Houses, and other architectural styles. Generally follows the great mix of houses that Seattle has. The Unique Bits: Ballard truly has some very unique bits. This adds a great deal of character to the neighborhood & town area in general. The town center area has artwork, and large art pieces on display. Over the waterway their are unique bridges that add an element of escape from the bustle of downtown Seattle. The Salmon Bay has hundreds of boats in the area. The list of unique characteristics is pretty long, my advice, but this neighborhood on the list of places to check out in Seattle. It is absolutely one of the best areas in the city! 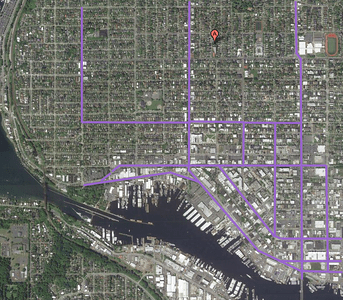 Arterial Mapping: Ballard has more than a few primary arterials coming into and out of the area. If you’re looking for an Interstate (which you shouldn’t be) then this is not the area of town for you. On the map below I highlighted some of the major arterials in, out, and around the area. Sleep Quality: I’ve not actually stayed in Ballard overnight, but just from spending multiple days there hanging out I can imagine the sleep quality one gets is very good. Even though downtown, which stays up late, is a quiet downtown, with a calm and safe demeanor (i.e. lower crime than most areas). A little further from the downtown core I imagine gets even more quiet and calm for a solid night of sleep. Night Life: The night life in the area is really good. There is art, music (rock, punk, blues, and other) in the area on the weekends, multiple festivals every year and a host of restaraunts, bars, coffee shops, and other establishments that stay open 10pm, and several that are open well into the night and into the morning not closing until 1 or 2 am. These establishments range from the fun little dive bar, the local bar with sloopers that are 34 ounces, to the trendier and more upscale establishments throwing in the adventurous drink mixes, well lit romantic establishments, and more. Transit Options: The transit options in Ballard are some of the best in the area. There is east west and north south options heading toward other major areas like Fremont, Wallingford, University District, Belltown, and of course Downtown. Most of the routes are frequent, and run pretty late into the night (midnight or later) and start running plenty early at 4 and 5 am. There are also plans for Rapid Ride (BRT), the D Line, to begin service in later 2012, which will provide 5-10 minute access to downtown and around the area during peak times and 10-15 minute during non-peak times. For more information about Rapid Ride check out the Rapid Ride Blog. To put it simply, Ballard doesn’t just have good transit options for Seattle, but good transit options compared to most American cities! Check out the map below for an idea of the routes + a layout of the downtown with many of the local establishments listed. Walk Score: Ballards walk score ranges between 100 (yup, it’s one of the best in the world – a walker’s paradise as walkscore states) to ~70ish which is still very walkable (Click the links for the walkscore map & additional information). Overall the Ballard area is easily one of the best areas to explore in Seattle, especially when the fairs and festivals are taking place! Transit Options: What buses traverse the area and what other town centers/areas are easily navigable via transit. Night Life: What time does the neighborhood generally “shut down”, or at least appear to. Sleep Quality: This is simply a combination of noise, crime, feeling safe, and other measures and feeling rolled into one. Ranking will be Good or Bad. Arterial Mapping: This will be a map of the primary transit & road arterials in and out of the neighborhood. The Unique Bits: This is a list of things that make a particular neighborhood unique. Think of it like a list that makes this neighborhood not like the ticky tacky, cookie cutter, suburban sprawl neighborhoods. This is my first entry in what will be a series. I’ve been searching throughout a number of neighborhoods to check out the ideal combinations of livability features. The lease is coming up in about 5 months and I want to be prepared to get into a more ideal location. Here are my measurements and data that I’ll provide with each of these reviews. Google Images with the search Madison Park, Seattle, WA. Bing Images with the search Madison Park, Seattle, WA. The first neighborhood that I’m covering here is Madison Park Area Neighborhood. This is a rather upscale, somewhat rich neighborhood that has great views of Lake Washington along the north and eastern edges and meshes up against the Madrona Park and Montlake Neighborhoods to the west and south. The neighborhood has hundreds of beautiful homes, condos of many architectural styles such as Cape Cod, Coastal, Colonial, Contemporary, Modernistic, European, Feng Shui, California, Row Houses, and other architectural styles. Barely a bad home among the lot, which is really impressive for any neighborhood of this size. Architectural Mix: Cape Cod, Coastal, Colonial, Contemporary, Modernistic, European, Feng Shui, California, Row Houses, and other architectural styles. There are two primary arterials coming into and out of the area. This can be a huge negative or positive. The Unique Bits: This neighborhood has some great unique elements. At the end of Madison Avenue is a strip of little shops, bars, and other things right across from a gorgeous park. In addition to this the views of Lake Washington are absolutely tranquil. Nothing in this neighborhood is outrageously unique, but a calm, conservative, collected uniqueness about the neighborhood does exist. Arterial Mapping: 2 Streets, East Madison Street & McGilvra Boulevard. The area is surrounded on the western, northern, and eastern edges by a park, a waterway, and a beautiful lake limiting the arterial route options. First there is East Madison Street that leads into and out of the area to downtown Seattle. This route is mixed traffic, primarily cars and small delivery type trucks. It is also the primary transit route in and out of the area. The second primary route south, along the lake is McGilvra Boulevard East that then merges onto Lake Washington Boulevard East. This route is absolutely beautiful riding along Lake Washington. Neither of these roads however connect to any major infrastructure, highways, Interstates, or other arterials. They’re also both slow moving routes, with maximum speeds around 20-30 mph. For residential lifestyles this is perfect, if you have a commute to outlying areas of the city this is going to add 15-35 minutes to whatever commute one already has. If you’re going downtown though the bus provides a direct and easy route down Madison Street. If one works at Boeing, Microsoft, or an outlying area though they should do themselves and the neighborhood a service and not move here. Otherwise you’ll be driving all the time, cluttering up the roads & causing congestion, etc. If you absolutely love it though, I suppose those are just the trade offs. Sleep Quality: Crime is low (almost non-existent), the area is very quiet, and sleep is easily to attain. The architectures of most buildings are solid, enabling quiet buildings even in stormy or wind whipping weather. Night Life: Night life in the area doesn’t exist. There are no theaters, late night bars, or music venues nearby. If you like quiet neighborhoods with minimal activity after 6-7pm this is a good area. If you want to enjoy art, music, movies, or anything of that sort one would have to leave the area regularly. Transit Options: For commuting to downtown areas, this is not a bad place. For getting to anywhere else in the city, or for after work hours transit usage this area doesn’t have except one option. Which for those car-free lifestyles really limits one. Walk Score: This neighborhood received an 83 – Very Walkable. Check out walk score for Madison Park for more information on the walk score, check out various commute measurements, and other information. Overall Madison Park Area ranks 28th in walkable areas in Seattle. Just for travelling context, the way I traveled into and out of this neighborhood was on these routes, via a zipcar.